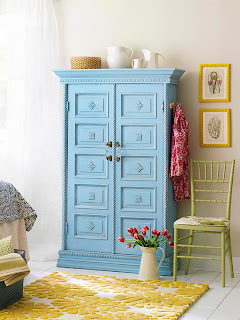 Fabulous Furniture Makeovers ~ Uncover the hidden charm of a cast-off piece with just a bit of creative thinking and elbow grease. 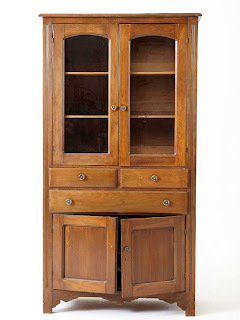 This boring, ordinary hutch touted plenty of storage, but it needed a fresh face. A fresh coat of white paint and new hardware brought the hutch up-to-date, but a mercury glass treatment on the glass doors launches the refreshed hutch into one-of-a-kind territory. To create the look, spray the back of the glass with mirror spray paint (like Krylon Looking Glass) according to the instructions on the paint can; we used five coats. Let dry. In a spray bottle, create a 1:1 vinegar and water mix and spray the painted surface with the mixture. 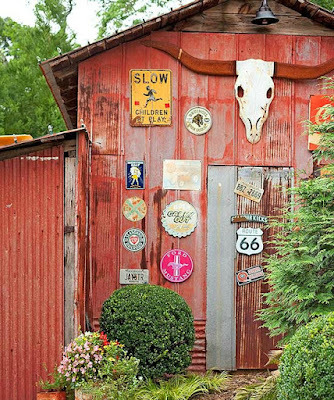 Blot with a rag to remove small patches of paint. Respray with one coat of the mirror paint. Scratches and scuffs left this sideboard looking a little forelorn, but a vision to revive the piece with pattern turned it into a showpiece. 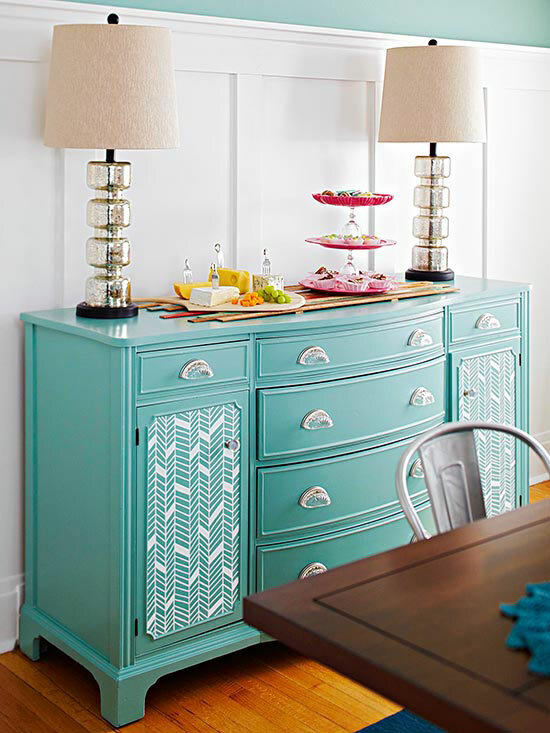 Turquoise paint lightened the look of the sideboard, while glass pulls give it a vintage-meets-modern look. A herringbone pattern, drawn with a white paint pen on the doors, solidifies the sideboard's chic status. 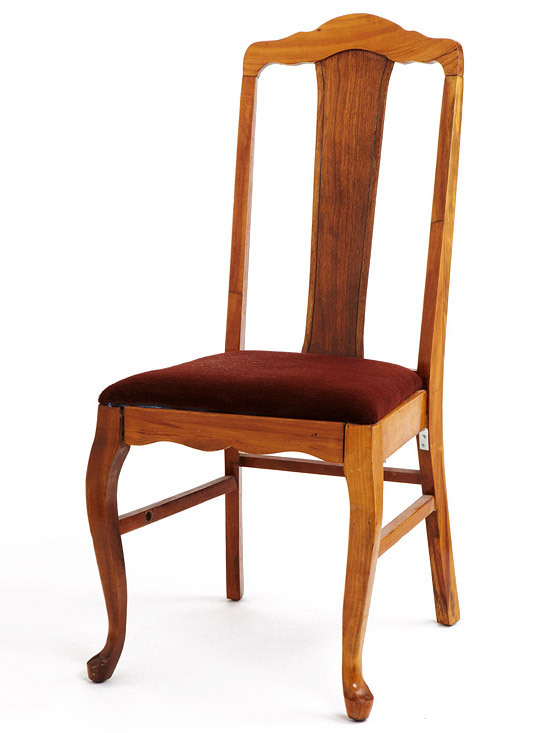 When the classics, such as this dining room chair, look a little stuffy for your taste, fresh finishes can help bring them into your style sphere. 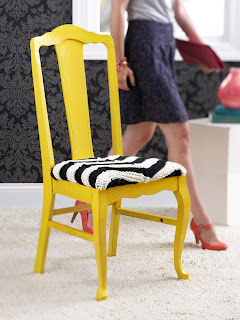 Bright yellow paint on the wood frame offers a modern, fun look to the chair, while a crocheted chevron-pattern seat cover masks the old velvet upholstery. The seat was removed and the cover was stretched over it and stapled into place, then simply reinstalled. The shabby condition of this hutch is no match for a savvy makeover starring molding. 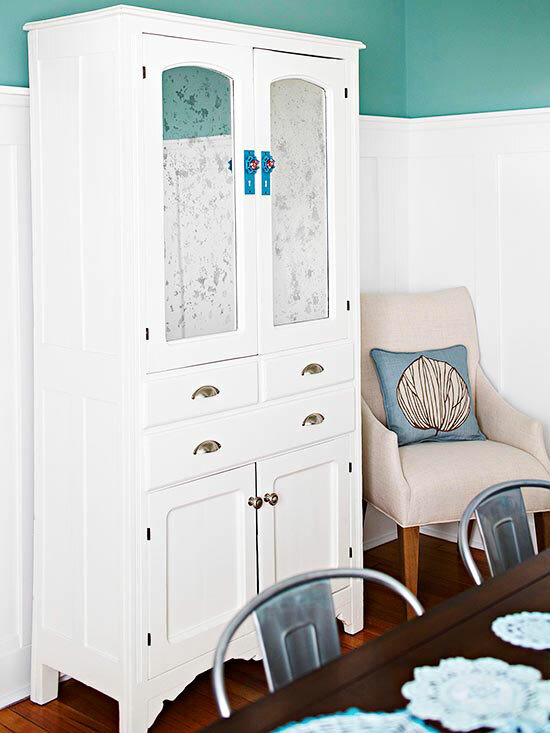 Layers of molding along the top and bottom add presence to the simple cabinet, as does bold sky blue paint. Rope molding outlines the doors, and the panels are accented with pretty medallions. 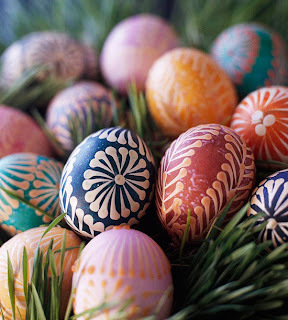 The embellishments were rubbed with a decorating glaze to give the color depth. 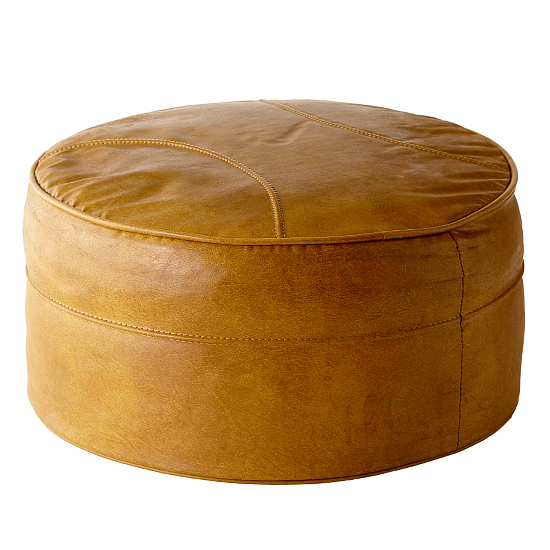 This hand-me-down footstool had all the charm of a 1970s rec room. 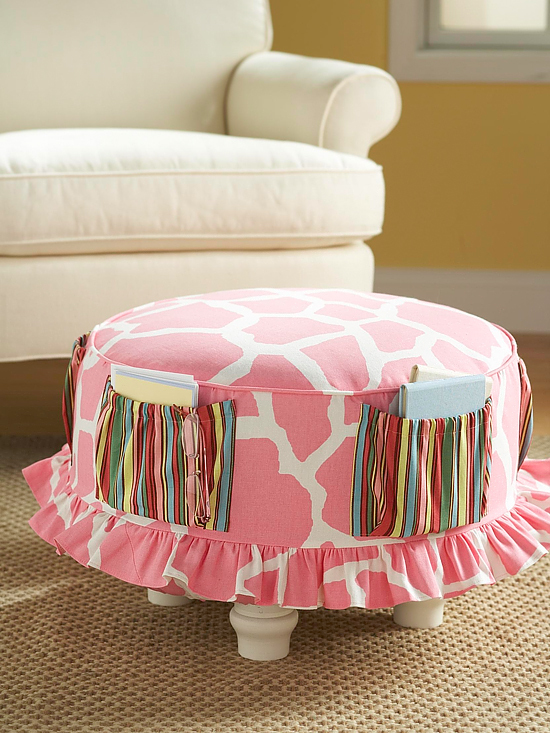 Colorful fabric and furniture feet give the ottoman a new life. Revamp a dull ottoman with a fun cover. Cut a circle of fabric for the top and a strip of fabric for the drop (remember to add seam allowances). Stitch covered piping along the top seam of the drop and a gathered ruffle along the bottom. Add five pockets made from contrasting fabric, inserting elastic into the top hem. Slip the cover over the ottoman. Screw painted legs to the bottom of the ottoman. 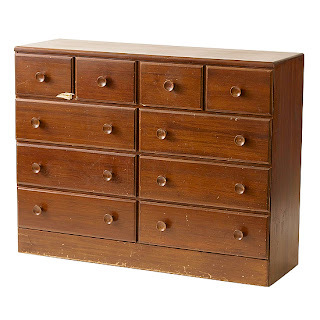 Nondescript, used, and abused, this dresser was languishing in a thrift store at a rock-bottom price. 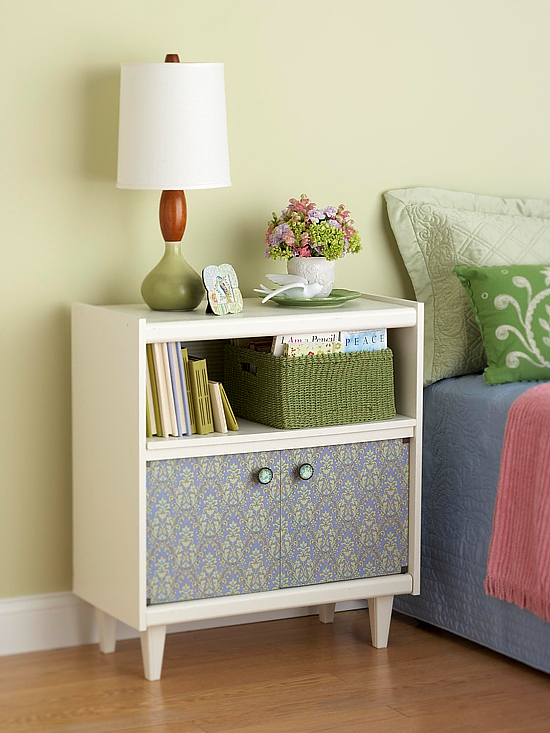 Give the furniture a dose of character and contemporary styling with paint. Coat the top in a fun color that contrasts with the rest of the piece and add some painted furniture feet. 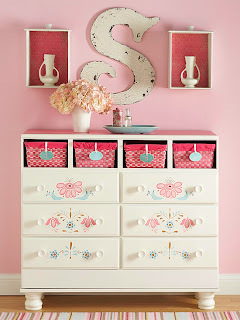 Embellish the drawer fronts with pretty stencils. Remove the small damaged drawers in favor of small lined and labeled baskets. Create shadow boxes from the small drawers, line them with patterned paper, and hang on the wall. 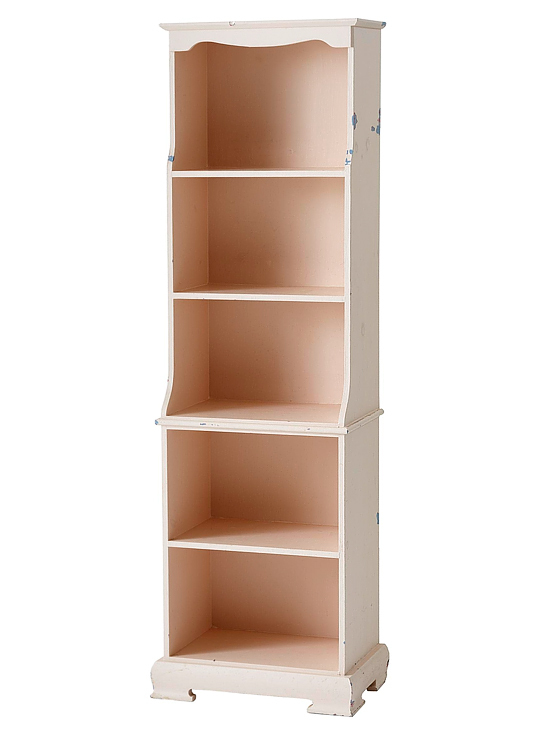 Basic and bland, this boring bookcase was functional but hid its potential. 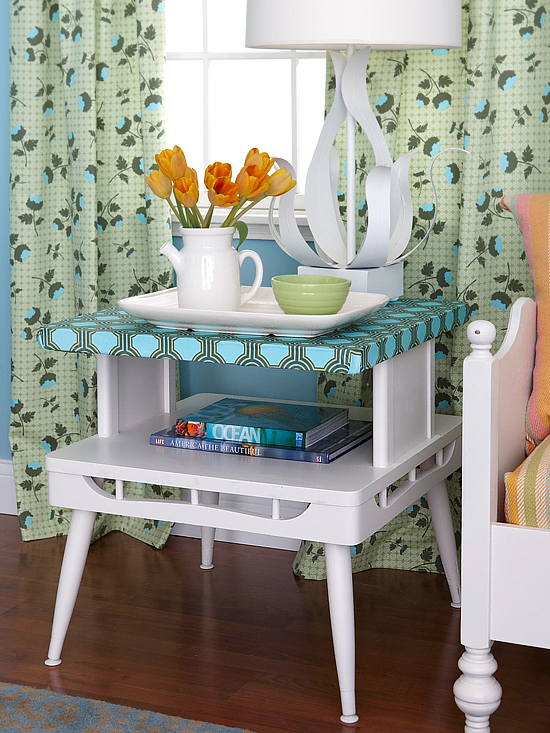 Make your bookcase more useful with a drop-down desk and out-of-sight storage. 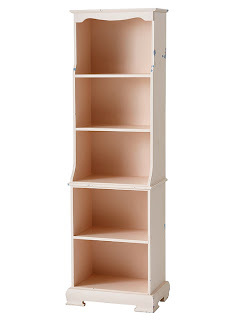 Cut doors to size from Medium Density Fiberboard, then prime and paint the bookcase and doors. 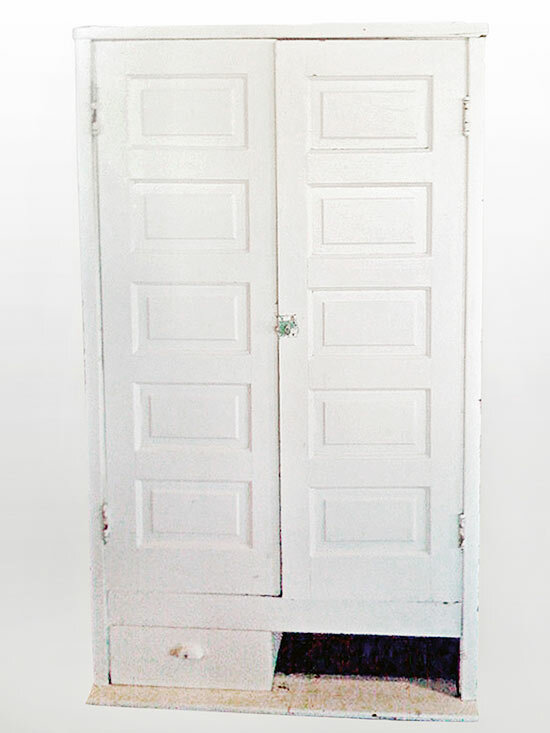 When dry, install the bottom door panel with French hinges and add the drop-down panel using hinges and chains. 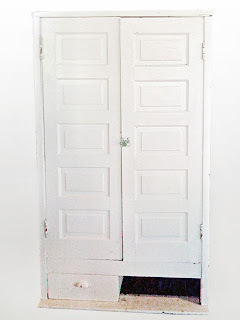 Finish the doors with a new knob and pull. Unattractive TV carts like this one are cheap thrift shop regulars. 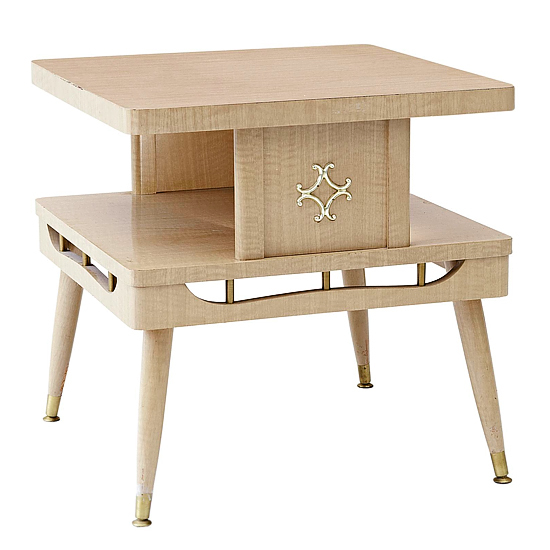 To turn an old castoff into a charming bedside table, start by removing the casters and replacing them with new wooden furniture feet. Prime and paint the cart. Remove the doors and decoupage the fronts with decorative paper. 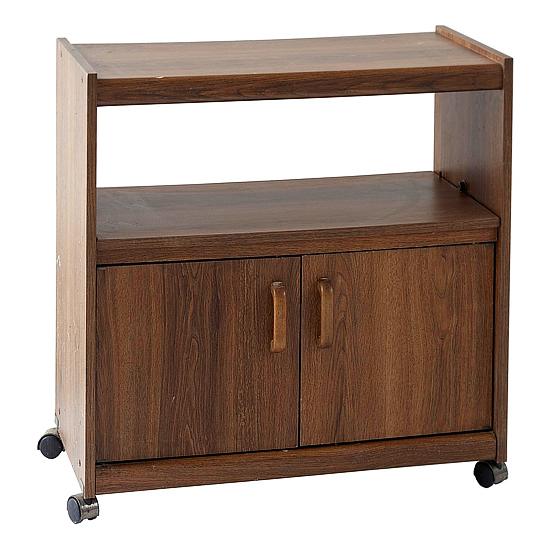 Cut a new back for the cart from 1-inch plywood and decoupage it with coordinating paper. Add new knobs to the doors and reinstall. 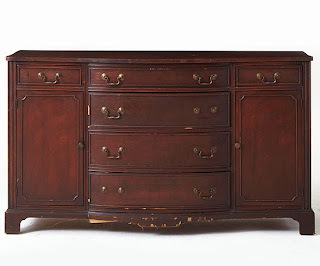 A cast-off bed had a decorative silhouette but the finish was dreary and damaged. 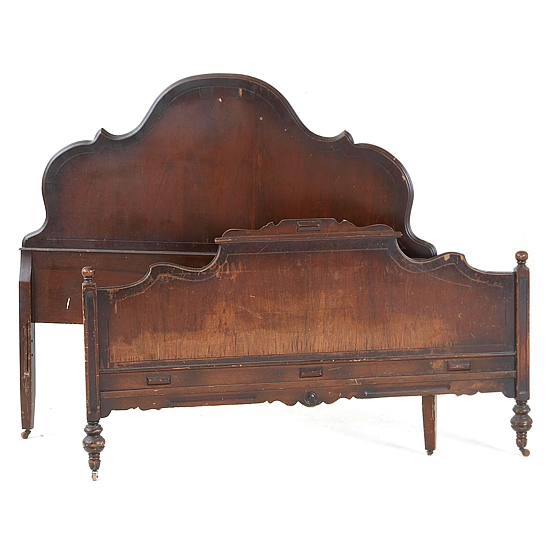 The bed becomes a charming settee when parts are reassembled. Cut the footboard in half vertically to form arms for the settee. Cut a piece of MDF for the seat and a piece for a front rail. 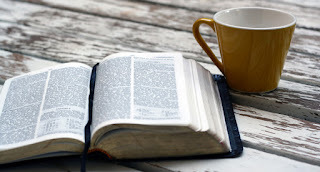 Assemble all pieces with wood screws and glue. Sand, prime, and paint the settee. When dry, add nailhead trim. For a cushion, wrap a foam pad cut to size with batting and a throw. Or sew the throw into a cover for a more structured look. This retro table had a nice shape but a not-so-nice finish. With a little paint and fabric, a new character emerges. 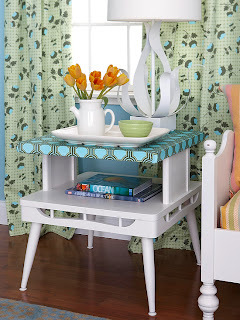 Prime the table and paint it white. 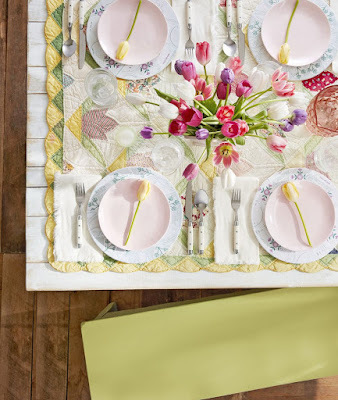 When dry, cut fabric to fit the tabletop plus extra to fold underneath. Set fabric in place and use decoupage medium to adhere it to the surface, smoothing with your fingers to remove air bubbles. 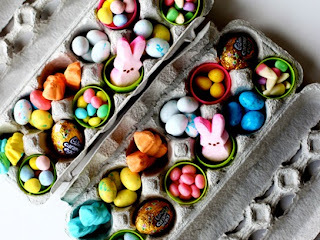 Apply several coats of decoupage medium, letting dry between coats. When dry, wrap fabric under table and staple to secure.